Heat oven to 375° F. Spoon a thin layer of sauce over the bottom of a 9-by-13-inch baking dish. Cover with a single layer of ravioli. Top with half the spinach, half the mozzarella, and a third of the sauce. 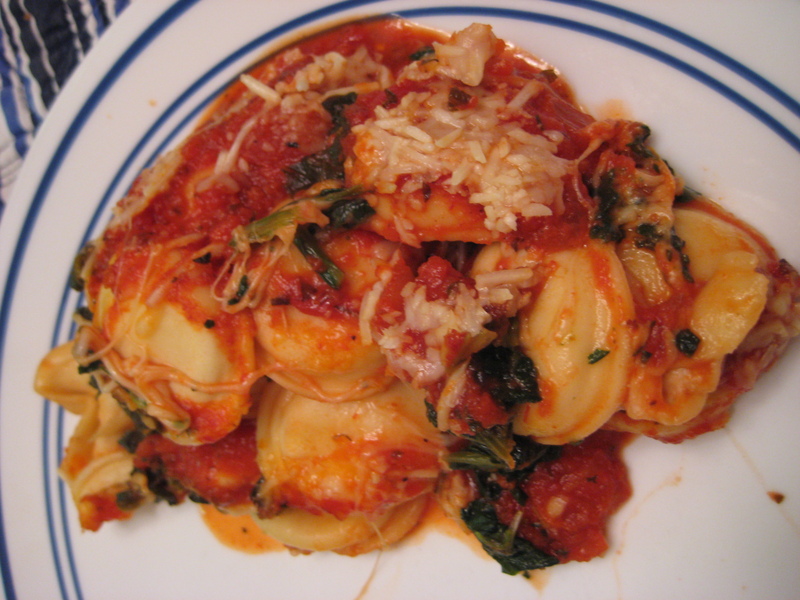 Repeat with another layer of ravioli and the remaining spinach, mozzarella, and half the remaining sauce. Top with another layer of ravioli and the remaining sauce (not all the ravioli may be needed). Sprinkle with the Parmesan. Cover with foil and bake for 30 minutes. Uncover and bake until bubbly, 5 to 10 minutes more. * I used frozen ravioli instead of the expensive refrigerated kind. I defrosted the frozen ravioli before using them in the recipe. The frozen ravioli worked great!